Most people are familiar with nasal sprays and the relief they can offer for various conditions. The spray is just one way to deliver various medications in a liquid form. It’s sprayed in the nose, or through the nostrils, and then the inside of your nose absorbs the medication. If you have been prescribed a nasal spray, here is everything you should know about how they work and how you should use them. There are four primary kinds of nasal sprays. These are antihistamine, decongestant, steroid, and saline. These sprays are used to manage several symptoms including nasal congestion, itchy eyes, sneezing, and runny nose. Antihistamines work to block histamines, hence their name. Histamines are something in your body that respond to the immune system. This inflammatory response can cause negative effects. Keep in mind that antihistamine nasal sprays can make you feel drowsy so use caution when using. The main use for decongestants are to shrink blood vessels in your nose which lessens the overall feeling of pressure. You might use a decongestant when you have a cold, flu, or sinus infection to help you be able to breathe a little better. They can also help you sleep by getting rid of stuffiness. Another nasal spray that is good for reducing the swelling in the nasal passages is steroid sprays. Using corticosteroids, these sprays treat allergies and sinus infections. Oftentimes, they are the first thing prescribed in these cases as they are simple to use and side effects are minimal. Saline is a substance similar to salt water that when sprayed into the nose, flushes and washes the membranes. They are used to remove allergy causing substances like pollen and dust. Similar to a neti pot or a saline wash, sprays do the same thing but on a smaller scale. No matter the type of nasal spray you have been prescribed, you should make sure you use it correctly. This means that the timing for the doses is critical. Follow the directions on the packaging or provided by your doctor. Keep in mind that overuse could signal dependance on the product and could end up being more harmful in the long run. The other thing you want to pay attention to is making sure you clean the nozzle after every use. You can use an alcohol swab or a spray of hydrogen peroxide to wipe it down. Do you have allergies, sinuses, or any other nasal problems where nasal sprays might be helpful? 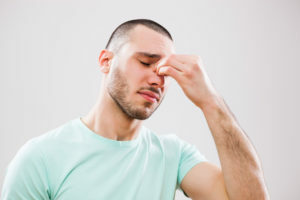 Contact Palm Beach Sinus Doctors today to get a correct diagnosis and the proper treatment plan to resolve your issues fast.